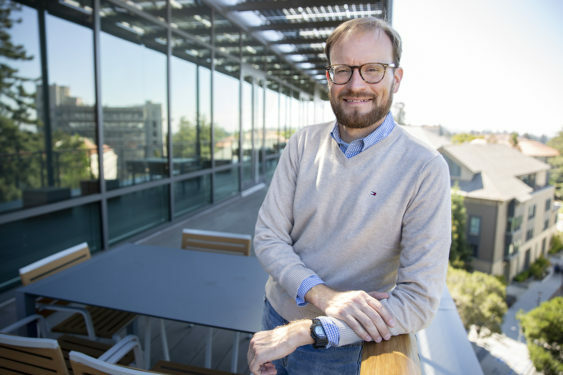 With his horn-rimmed glasses, wool sweater and goatee, John Gribowich blends in with many of the buttoned-down professionals in the Berkeley MBA for Executives Program (EMBA) at UC Berkeley’s Haas School of Business. But Gribowich, 39, is equally comfortable in a robe — as a priest who often leads Mass at St. Joseph the Worker Church after beginning his day serving breakfast at dawn to the homeless in downtown Berkeley. “I never take my priest hat off,” says Gribowich, who has chosen to live at St. Joseph’s throughout the 19-month EMBA program, which typically draws a cohort of about 70 professionals from around the world to learn leadership, strategy, entrepreneurship and finance. Last April, Gribowich was released from his parish duties in Brooklyn, New York, where he served as an assistant pastor, to work at DeSales Media Group, the communications arm of the Diocese of Brooklyn. At the time, DeSales, which publishes and broadcasts news from a Catholic point of view, had plans to launch a big tech project to connect and modernize the systems shared by all of the diocese’s local parishes. Taking a gamble, Gribowich applied only to Berkeley Haas. It paid off, and he headed to California, joining a diverse EMBA cohort that this year includes an artificial intelligence expert in the Pentagon, four doctors, an expert on rare wine and an Italian woman who commutes to class from her solar power startup job in China. One student speaks seven languages, while another helped rescue 11 hostages in a presidentially approved military operation. Gribowich is the only student priest in the history of the EMBA program, says Susan Petty, the program’s director of admissions. Growing up in Bucks County, Pennsylvania, just north of Philadelphia, Gribowich says he felt pulled to the priesthood as early as first grade. While initially drawn to the priest’s external actions, the intellectual and spiritual sides of the vocation had become more intriguing and attractive to him by high school. As a priest, he says he’s aligned with a long tradition of Catholic creativity that he feels has waned in recent years and that he would like to help revive. “There is something about being Catholic that should intrinsically stir innovation, because you are constantly searching for that which is real and true in the world,” he says. Gribowich adds that his creativity is inspired by everything from playing guitar to listening to Bob Dylan to studying a Caravaggio painting. As a Catholic, Gribowich follows the teachings of the late Dorothy Day, a political radical who was central to the pacifist Catholic Worker Movement, which combines aid for the poor and homeless with nonviolent direct action professed by Indian activist Mahatma Gandhi. Five years ago, Gribowich’s love of Dorothy Day led him to help found a Catholic Worker farm in Harvey’s Lake, Pennsylvania, where workers and students visit to connect with the land. The farm, run by two of his former undergraduate professors from DeSales University, a private Catholic university, donates its produce to local food pantries. Carol Shumate, one of Gribowich’s EMBA classmates, says students were curious about him from day one, when they all introduced themselves. “They were like: ‘What’s a priest going to do with an MBA in the church?’” she recalls. That first day, she says, Gribowich drew the biggest laugh of all when he described his love of Bob Dylan, whom he has seen perform more than 40 times. “He put his hand up and said, ‘This is how much I love God.’ And then he put the other hand just beneath it and said, ‘This is how much I love Bob Dylan,’ ” Shumate says. Shumate, who calls Gribowich “one of the most fascinating people I have met in the recent past,“ says she’s always surprised when he talks about history and art, sometimes breaking out in song. One day, he crooned Neil Sedaka’s “Oh! Carol” to her, a song she’d never heard but which he explained to her in detail. Professor Lucas Davis, who teaches statistics, says Gribowich’s unique perspective comes through “even in a class as a class as dry as statistics,” where Gribowich, rather than answering a question, might question Davis’ thought process in asking the question. After Gribowich graduates, he plans to return to Brooklyn and his job at DeSales, where he will navigate the process of providing local parishes and nonprofits with tech tools to manage everything from data — such as historical information found in the church’s marriage and baptism documents — to the church’s financial records. But for now, he’s enjoying UC Berkeley and the academic experience in his EMBA class, which will head to Santa Cruz this month to explore leadership communications in one of the program’s five week-long experiential field immersions. Other immersions include trips to Silicon Valley, Napa and Washington, D.C., as well as overseas. Girard is news editor for media relations at the Haas School of Business University of California, Berkeley. Article and photos reprinted with permission.